Think of the weirdest looking gourd you've ever seen. What do you think would be a good name for that gourd? Why? Why do you think people are willing to pay so much for weird-looking gourds? As the article points out, the commodification of autumn has churned out everything from Starbucks lattes and flavored Twinkies to "fall-scented" kitty litter. What fall-themed items have you seen on the shelves? Which one is your favorite? Why? According to the article, ugly produce makes up to 40 percent of food waste in some countries. 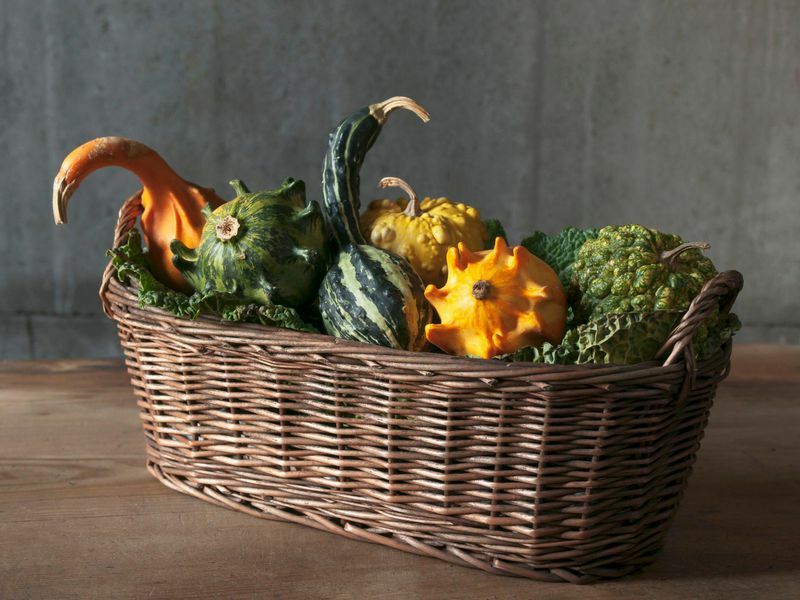 The ugly gourds featured in this article are raised to be decorative items, not food. So would you say these gourds are really having a "culinary moment," or do you think they add to the food waste problem? As a class, brainstorm a list of traditions associated with the fall season. As students contribute items to the list, encourage them to share what they know about each one. Instruct students to select one tradition. Give them time to conduct research to learn more about it. Encourage students to find out how the tradition began and where, when, why and how it is observed. Challenge them to uncover ways the tradition has changed over time. Have students create an advertisement about the fall tradition they investigated. Encourage students to brainstorm ideas for a slogan that will entice people to observe their tradition. Invite students to present their advertisements to the class. Encourage them to explain how their slogan summarizes what the fall tradition is all about. Challenge them to identify aspects of their advertisements that they think will entice people to observe their fall tradition. As a class, select one fall tradition. Brainstorm ideas and select a slogan that summarizes what the tradition is all about. Divide the class into small groups. Encourage groups to conduct their own research to learn more about the tradition. Then have each group create a print advertisement about the fall tradition that includes the class slogan. Divide the class into small groups. Instruct each group to select one fall tradition to investigate. Have groups conduct research to learn more about the tradition they chose. Then have each group come up with a slogan and create a print advertisement that will entice more people to observe this fall tradition. Divide the class into pairs. Instruct each pair to select a fall tradition. Have partners conduct research to learn more about the tradition they chose. Based on what they learned, challenge partners to think of a slogan that summarizes what this tradition is all about. Then have them write a radio advertisement based on that slogan that will entice more people to observe this fall tradition. Have students record their advertisements and share them with the class. Divide the class into pairs. Instruct each pair to select a fall tradition. Have partners conduct research to learn more about the tradition they chose. Based on what they learned, challenge partners to think of a slogan that summarizes what this tradition is all about. Then have them write the script for a television advertisement based on that slogan that will entice more people to observe this fall tradition. Have students gather props, recruit classmates as actors and film their TV ads. Invite pairs to share their finished products with the class. Invite students to watch this video from the Renwick Gallery of the Smithsonian American Art Museum in which Public Programs Coordinator Gloria Kenyon demonstrates how to make fall wreaths. Decorative gourds may be all the rage, but pumpkin is still king when it comes to fall squash. Read this Smithsonian magazine article to learn how to think outside the piecrust and explore other ways to put pumpkin on your table. Every year on the fifteenth day of the eighth lunar month, when the moon is at its roundest, Chinese families gather to celebrate Mid-Autumn Festivities. Invite students to watch this animation from the Smithsonian Center for Folklife and Cultural Heritage to learn more about this fall tradition. The Smithsonian Butterfly Habitat Garden at the National Museum of Natural History is home to a variety of plants, insects and butterflies. Invite students to watch this video in which Jonathan Kavalier, Smithsonian Gardens horticulturist, shares some important facts of butterfly gardening and provides viewers with several fall gardening tips. Whenever autumn arrives, whether in a blaze of brilliant leaves or with subtle changes in the life cycles of flora and fauna, the season holds a special beauty. Invite students to explore this Smithsonian site to see how natural-science illustrations combine art and science in the close observation of nature and how artwork from around the world and across time can capture the mood, color and light of the fall season. All across the country, birds are making the trek south for the winter. Read this Smithsonian magazine article to learn where some of the best places to witness their journey are located.